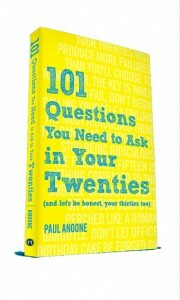 To find important life answers in your 20s, you need to start with good questions. 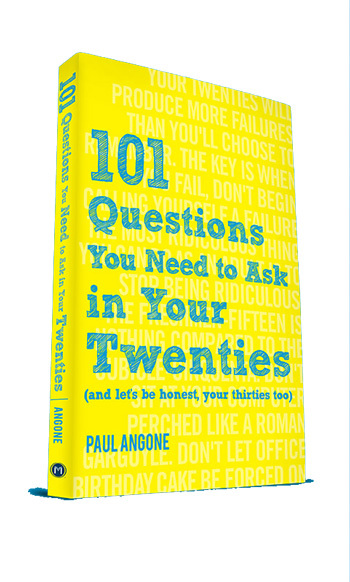 Engaging, in-depth, a book for twentysomethings, and parents and leaders of twentysomethings. 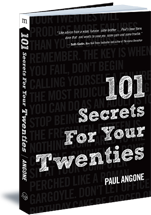 Written with the same humor, insight, and engaging style as Paul Angone’s best-selling book 101 Secrets For Your Twenties, but this time he’s digging even deeper. With over 200 300 reviews on Amazon and translations done for Thailand, Russia, Vietnam and India, 101 Secrets For Your Twenties has become an international sensation, encouraging twentysomethings all over the world. Your 20s are filled with confusion, lousy jobs, anticipation, disappointment, cubicles, break-ups, transition, quarter-life crisis, loneliness, post-college what the heck, moderate-success sandwiched in-between complete failure, and we need a worn, weathered guide stashed somewhere close to help show us the way. This is that book. Expanded from the blog post 21 Secrets for your 20s that spread like Internet wildfire with over a million readers in 190 countries, 101 Secrets For Your Twenties will encourage, inspire, prompt a plethora of LOL’s and kick-start your life forward with its witty, honest, and hilarious wisdom-stuffed-pearls to help you rock life in your twenties. If your twenties have gone nothing like you planned – you’re not alone. Career doubts. Crushed dreams. Relationship debacles. Faith struggles. And flat out groan up awkwardness. 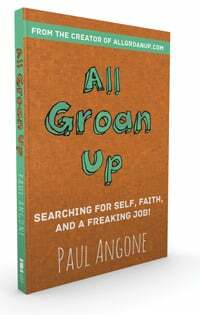 In Paul Angone’s newest book All Groan Up: Searching For Self, Faith, and a Freaking Job! (Zondervan) that early reviewers are calling “risky, hopeful and wicked funny“, he shares his hilariously embarrassing and strikingly candid story through the ambiguities of adulthood. He pulls back the veil on the unspoken fears, doubts, lies and BIG questions you are facing and smacks them in the face with truth and hope.